The unbelievable started only a few days after I received the instrument. As I am a pensioner for one year now, it is my habit to take a catnap on the sofa after dinner. With the magnetic therapy device placed on my chest I enjoying its beneficial and comforting effect. Lately however, I noticed that my dog Wolfi became quite insistent about trying to lie in my lap while I was relaxing on the sofa. This is quite impossible as Wolfi is a huge German shepherd and has never been a lap dog. Furthermore, it is quite unbecoming in a well-trained animal. Unfortunately, Wolfi is already 15 years old, not yet sick, but plagued by the usual discomforts of old age, such as pain in the joints. Wolfi used to be very lively, he demanded long walks, was continuously hungry and ready to play any time and has been, above all, very attentive and watchful. Unfortunately, this is long past. Measured in a human life-span, Wolfi has reached senility. But, since I started treatment with the magnetic therapy device we now see changes. To make a long story short, I fell asleep on the sofa. 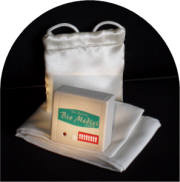 The magnetic therapy device always provides me with deep and restorative sleep. When I woke up, Wolfi was next to me, blinking sheepishly and licking my face. He then jumped off the sofa (normally he would have painfully climb down) before I could rise, wagged his tail and asked me in his particular dog fashion, to go for a walk, just like in old times. I was so surprised that I at first did not notice that the instrument for the past two hours must have been resting not on me, but under Wolfi! Thereafter, Wolfi gave me the impression of almost being youthful. Over the next few days I observed him while pretending to sleep. He waited a while, watching me in turn. Slowly, so I would not notice, he climbed onto the sofa, to take a nap with me. I noticed that after a little while he very carefully pushed the magnetic therapy device with his snout from my chest. As I was lying on my back, the device had fallen between us, exposing both of us to its restorative powers. So this was the solution to the riddle! Wolfi's instinct had told him of the healing properties of magnetic therapy. He must have perceived that it was good for him. From then on, we shared the instrument. At night, I place the magnetic therapy device in his sleeping quarters. Ever since, Wolfi sleeps deeply. His relaxed snoring is very evident and he does not need to go out any more during the night due to improved bladder control. Again he is lively, enjoys an improved appetite and is quite happy. He seems rejuvenated and we take long walks. Both of us are healthy, active and "happy." I am convinced that Wolfi will be with me yet for a long time, thanks to the magnetic therapy device. Therefore, I would like to order an additional Bio-Medici, so I also can enjoy its benefit during the night. Our dog Bob is the one who has ended up needing the magnetic therapy device the most. We have had great success with the treatment since he started developing osteoarthritis as well as Prostate problems. The prognosis of our physician was devastating three years ago. In May, we will celebrate his 18th birthday. This will be a big event. Bob also fell at night with the Bio Medici in our pool, since that time we call it the Submarine Bio Medici. We opened the device immediately and dried it with a hair dryer and luckily, (you don't want people thinking it is waterproof) it works well again. 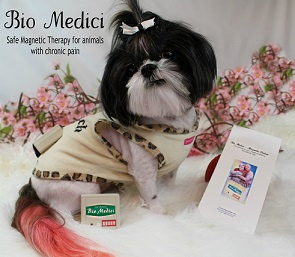 If the vets knew about the advantages of the Bio Medici, they would have sleepless nights. Especially as dog owners could save a lot of money, since the vets ask unbelievable fees. The vets here are not really specialized for small animals; therefore the dog owners have to help themselves. We highly praise the Bio Medici, because without it our Bob would not be around anymore. My little dog "Shiwa" is no longer young but very playful still. A few weeks ago a terrible thing happened: Shiwa played with a huge she-wolf dog. During play she had placed her enormous paw on Shiwa, pinning him down. Shiwa was unable to get up. What a shock. I had to carry him home and was afraid that his spine was broken. He just whimpered quietly. In my desperation I put the BioMedici magnetic pulser into his basket. Then I called the veterinary surgeon. The vet arrived about an hour later. He was just as amazed as me, when Shiwa jumped out of the basket to greet him. No bones were broken but something must have hurt Shiwa very much. There is no doubt, the magnetic pulser has helped and since then Shiwa too knows the effect of the Bio Medici. He insists I put it into his basket at night and verifies if I really did. He whines and whimpers... but as soon as I put the magnetic pulser on him, he curls up and falls asleep peacefully. And, so do I! ATTENTION: The BIOMEDICI magnetic therapy device should not be used by persons with pacemakers, by pregnant women, or after myocardial infarction. Caution is also advised in those cases where your symptoms should first be examined by a doctor or when additional treatment is required which must not be delayed.